my client wants me to cut 1.5-2" thick logo/letters for a prop, and I’m not clear on if my SH3 can handle this. There is enough z travel, but how much does the bit/tooling need to stick into the dewalt? I guess the biggest tool i can use is a 1/4" shank … so what is the maximum thickness that I can cut with my Shapeoko ? you’ll need to flip the workpiece if you can’t tolerate a bit of rubbing. If not, you’d want to work up a suitable toolpath which avoids that, say a series of stacked pockets with gradually increasing offsets from the geometry working your way down, then a final pass with really aggressive, and gradually decreasing depth of cut working your way down to the bottom. What do you mean by ‘rubbing’? 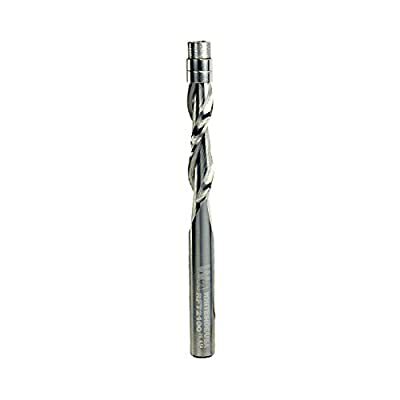 I’m looking at this and thinking it should work in my 1/4" collet.Seems like the cutting edge doesnt have to go the whole distance- if its already cvut -maybe that post-cut contact is what you mean about ‘rubbing’.? I have been known to cut to a depth of about .75” and then finish with a bandsaw/jigsaw and then long pattern bit in my router table. The problem is my pattern bit D is .5”, so corners can be a problem. Also not having a router table and jig saw could be a problem. It can be done, just have to do a little planning. Correct. Rubbing is the shaft of the endmill spinning against the material when you cut deeper than the flutes. It is possible to get that done on your S3. I am just in the middle of a HDPE project and found that it is a great material to work with. Plan for the tool stick out, run some test cuts in the air and than in XPS foam to be absolutely sure that you will not have collisions. You might not be able to use a dust shoe depending on your setup. 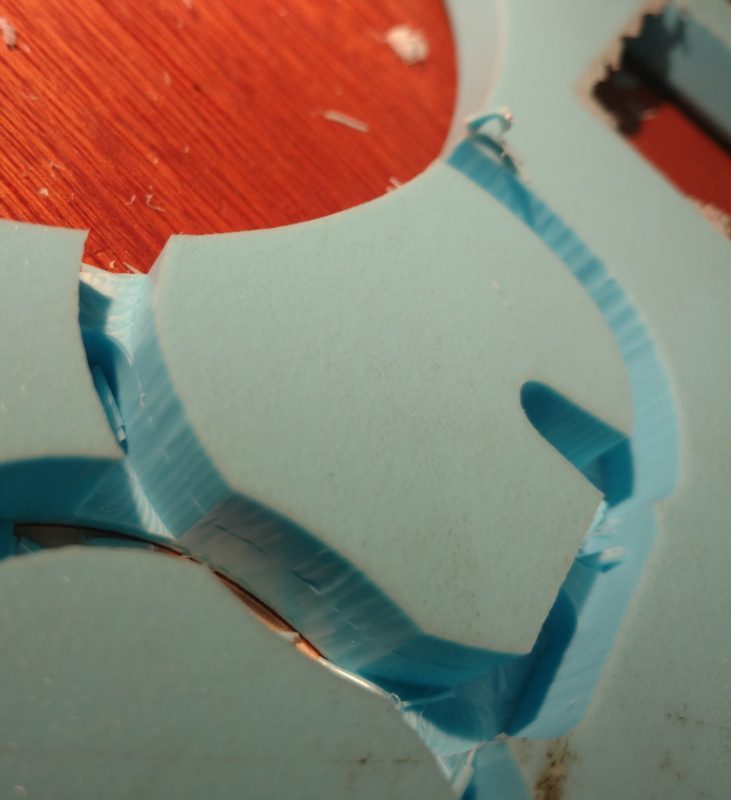 You can also cut out the letters from thinner material and than bond the layers with epoxy. It is possible to make the lines between layers almost invisible with a little attention to detail. Think about the chip evacuation and try to prevent chips getting into the Z axis! I run the machine with f:1960; DOC:3; WOC:2,2; 22000 RPM; MRR 12.94 mc3/min; with a 2 flute carbide endmill. It is possible to almost triple the MRR sacrificing the surface finish. thks everyone i hadn’t seen all the replies until today- not sure why since im set up to receive them. I did a feed calculation and came up with 160 ipm @ 16000. Seems like a lot, but maybe not for HDPE. Terrified im gonna snap this new bit, so gonna work my way up to that rate. i figure that will be less inclined to break my tool. I’ve not had the greatest luck with single o flutes (from Onsrud or anyone else) on acrylic. I know everyone says they’re the greatest bits for the application but meh. Looks like the bit you purchased is a downcut bit. That might not be the best choice for HDPE. This forces the chips downward causing them to be recut. This could lead to melting and less than ideal cutting scenarios. I would suggest trying an upcut bit to see if that makes any difference. possibly because I’m using corrugated cardboard under the stock to protect my wasteboard. Like the regular cardboard shipping boxes are made from? I can’t see that working at all, the piece will flex and chatter like crazy I would think, especially on smaller pieces where the load isn’t distributed over a large area. You can use hardboard, like the kind clip boards are made from, I use that under my work very successfully, I even use it just under the corners of large 24"x24" sheets of plywood just at my clamping points and have zero issues, but cardboard, no, don’t think that will work. I use a regular old carbide 3 flute upcut bit on HDPE and it cuts like a champ. So, yeah, I talked to helpful guy at Onsrud and he pointed out I bought a downspiral and that was not gonna fly. I managed to go to my local tooling store and get a proper single 0 upcut from southeast tool, I ran a test at 80ips feed and put a piece of luan under the stock this time, clamped it . But Im still not seeing the kind of results I was getting with simpler single and or double straight flutes. IM wondering if my relatively new machine is due for its first calibration, or if my feed and speeds are too far off. Ive been super conservative . this test is at 80ips. Last I calculated it should ultimately be twice that at 160 (?). Also, does stepover even apply in any way to the walls? or does it just apply too the ‘floor’ scalloping ? Two flutes are better than one. I do a lot of my work similar to what Phil mentioned above. I come back and use a trim router with this whiteside 1/4” pattern bit. 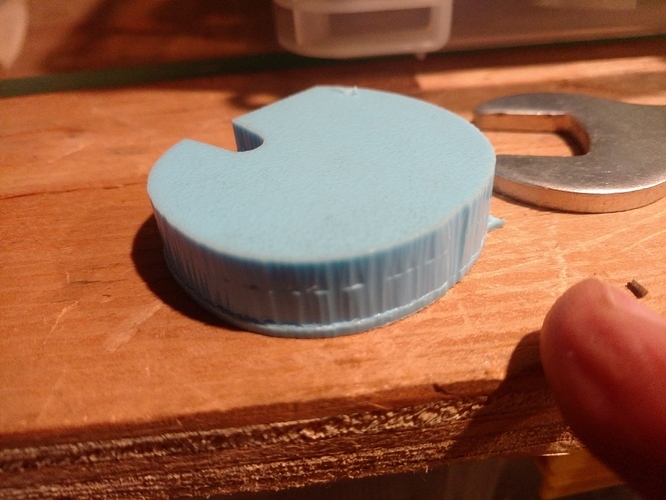 I love it because it has a 1/4” diameter bearing and can follow most corners I make on the Cnc router. I have one of those RFT2100 bits, too. I haven’t used it a ton, I was always worried it would be pretty delicate and didn’t want to push it too much, preferring to keep it on-hand should a need arise. You find them to be pretty tough? Anything you can share about its use? The first one I had did eventually wear out but I was very rough on it. I started out by cutting five cherry built cabinets (8’ tall) worth of saw tooth standards using this bit. I used the shapeoko to make a Baltic birch template, then used this but to follow that template on 40 pieces that made up each of the four corners of the cabinets (above and below a fixed shelf). I’ll admit, I think I dulled that bit up quite a bit on that project, but I used it for another few months before I started using a new one. I’ve used the new one for about a year and have had no issues. I almost always cut away most of the waste on my bandsaw first, which is something I did not do on that first bit. That has prolonged the bit for sure. I’m surprised it has done as well as it has, but I’m sold on it as I’ve probably abused it quite a bit…that and the Bosch colt that I dedicate to the bit. I’ve accidentally tripped on the cord a few times and brought the whole thing down…I honestly can’t believe neither the bit nor the router has had an issue based on that alone!